The 15 feet tall Veterans Memorial Bell Tower is constructed of whitewashed brick to match the color of the nearby courthouse. The tower is an open structure with four brick columns supporting the bell housing. Bronze plaques describing the history of the bell and construction of the memorial are attached to the four columns. Included in one of the columns is the cornerstone from the 1902 courthouse that burned in 1967. Tower Plaque: THE TOWER / THE BELL AND CORNERSTONE WERE REMNANTS OF THE ALEXANDER COUNTY / COURTHOUSE FIRE THAT OCCURRED AUGUST 11, 1967. THE REPAIR OF / THE BROKEN BELL WAS ACCOMPLISHED BY ROWE B. CAMPBELL, A LOCAL / BUSINESSMAN. AT A LATER DATE, BOTH THE BELL AND CORNERSTONE WERE / PLACED ON THE GROUND ON THE EAST SIDE OF THE CURRENT COURTHOUSE. A WORKING GROUP OF THE ALEXANDER COUNTY SESQUICENTENNIAL / COMMITTEE, PROJECT PERSON BENJAMIN W. HINES, CHOSE TO PRESERVE / THE BELL AND CORNERSTONE. 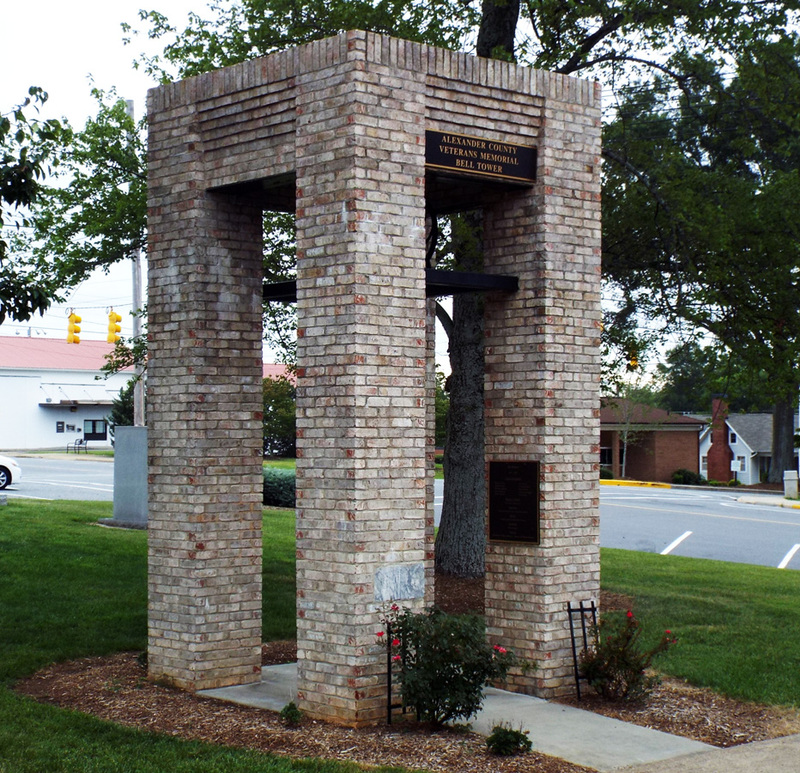 THUS, IN 1997 THE INITIATIVE BEGAN AND / NOW WE, THE CITIZENS OF ALEXANDER COUNTY DEDICATE THIS THE / “ALEXANDER COUNTY VETERANS MEMORIAL BELL TOWER” TO ALL OF / OUR HONORABLE VETERANS PAST AND PRESENT WHO HAVE SERVED OUR / COUNTY – STATE – COUNTRY IN THE NAME OF FREEDOM. Bell Plaque: THE BELL / PURCHASED CIRCA 1850 AT A TOTAL COST $68.50, THIS BELL CALLED / COURT INTO SESSION AND LENT ITS VOICE TO MANY OTHER COMMUNITY / EVENTS. BEFORE REFRIGERATION, IT ANNOUNCED THAT FRESH MEAT WAS FOR SALE / AND WHEN FIRE OCCURRED, IT SOUNDED THE ALARM. IT IS SAID THAT WHILE BEING PULLED ON A CART TO “SERENADE” A PAIR / OF NEWLYWEDS, THE BELL FELL TO THE GROUND AND WAS CRACKED. IT JOYFULLY ANNOUNCED THE ENDINGS OF WORLD WARS I AND II, AND / RANG IN EACH NEW YEAR IN THE 1940's AND 1950's. Bell Tower Funding Plaque: BELL TOWER FUNDING / TO DEFRAY THE COST OF BUILDING THE BELL TOWER, FUNDS WERE RAISED / BY INDIVIDUALS, VARIOUS ORGANIZATIONS, FROM THE SALE OF THE / ALEXANDER COUNTY SESQUICENTENNIAL AFGHANS AND LOCAL COUNTY / GOVERNMENT. THOSE WHO CONTRIBUTED $500.00 > ARE DESIGNATED AS A / “DONOR”. A DONATION OF $500.00 < ARE DESIGNATED AS A “SPONSOR”. DONORS / IN MEMORY OF THE CHARTER MEMBERS OF THE ALEXANDER COUNTY / HISTORICAL ASSOCIATION. / IN MEMORY OF JOHN L. GWALTNEY AND CHARLES E. ECHERD, / COMMUNITY LEADERS, BY GRANDDAUGHTER/DAUGHTER FLORA LUCY EDHERD. / IN MEMORY OF BAXTER AND MAGGIE HAYES BY SON BAXTER. / IN MEMORY OF GWEN HOPE KERLEY HINES BY HER HUSBAND BENJAMIN. / IN MEMORY OF LOYD WAYNE MAYES BY HIS WIFE MARGIE. / IN MEMORY OF ROWE B. CAMPBELL, BY BUCKY AND ANN CAMPBELL. / IN HONOR OF THE CITIZENS OF ALEXANDER BY THE ALEXANDER COUNTY / COMMISSIONERS (1997 TO 2003). The memorial bell tower is located on the lawn of the Alexander County Courthouse, 29 W. Main Avenue in Taylorsville, NC. It stands to the left from the courthouse main entrance. Nearby stand the World War I and World War II marker, and the Korean and Vietnam Wars marker. Across the courthouse lawn to the right are the Alexander County Confederate Monument and Civil War cannon and the Alexander County Confederate Dead memorial. The bell tower stands on the front lawn surrounded by trees and bushes.